Allure is one of the industry's leading brands whose bridal collection includes a variety of beautiful styles with something for every bride. Allure bridal gowns are high quality, well designed gowns with detailed beadwork, beautiful appliques, and modern silhouettes. Allure gowns are constructed with high quality materials and exquisite fabrics for an overall wonderful fit and polished look. 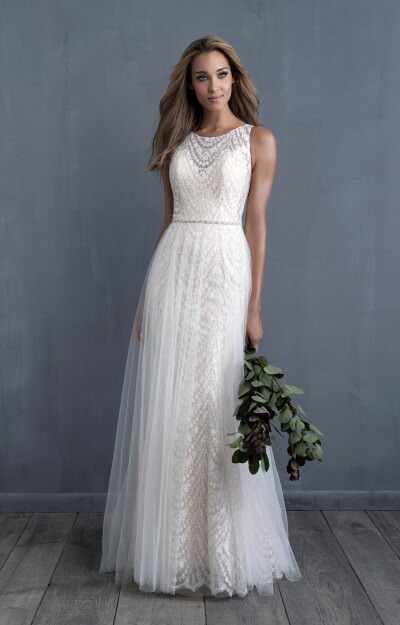 Every fit and style can be found among the Allure bridal collection including A-line gowns, ball gowns, and mermaid as well as fit and flare styles. Everything from silky charmeuse to flowing chiffon or vintage style lace can be found in this collection. There are also several lines within the Allure family that cater to brides desiring a specific look for their wedding. Want to make a statement on your big day? The Allure Couture collection includes more dramatic styles and gowns with a high fashion look. Dreaming of a perfect, charming ceremony with family and friends? 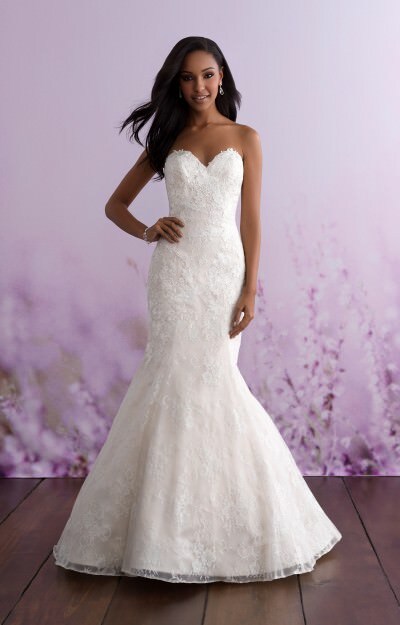 Allure Romance gowns are more traditional styles with less dramatic, but just as beautiful cuts and detail. Getting married on the beach or eloping to a tropical getaway? 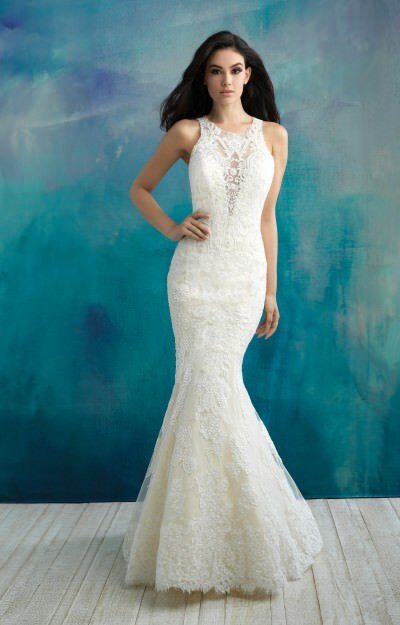 Allure also offers a line with styles appropriate for destination weddings as well as a line with silhouettes designed for full figured brides. 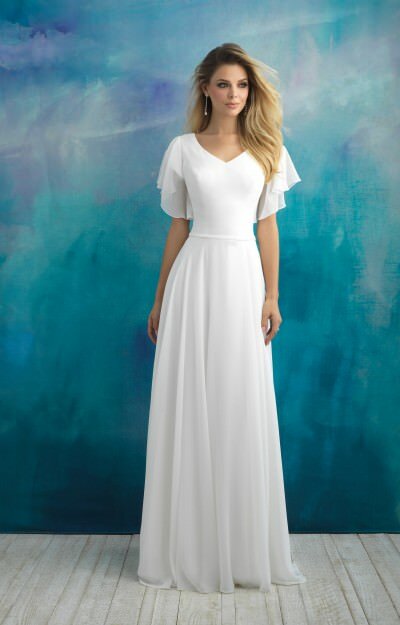 Beautiful modest styles with sleeves and more demure necklines can also be found in the Allure Modest collection. Allure gowns are available in sizes 2-32 with certain styles also available in sizes 16W to 32W. 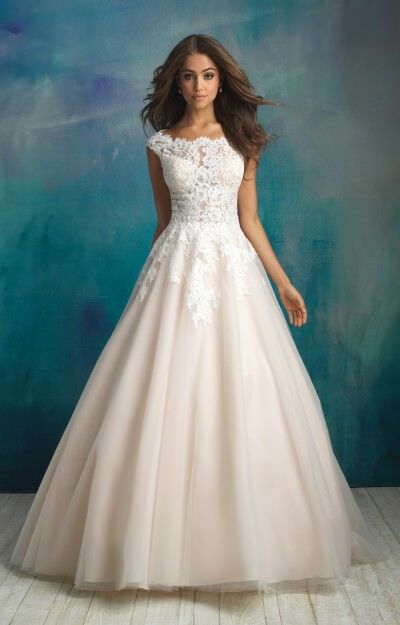 Most Allure bridal gowns can also be ordered in white and ivory with specific styles available in other colors as well. Brides have described Allure gowns as luxurious, modern, sophisticated, and elegant as well as affordable! The wide range and sheer number of styles gives brides many options to choose from, no matter her budget or style! With so many options and such gorgeous gowns, it's no surprise that the Allure brand is one of the most popular brands among Castle brides. You are sure to find what you are looking for within this amazing collection! Many other brides already have! Check out the styles below to see what Allure has to offer!